Sandplay therapist, Judy Zappacosta, MFT, first became interested in the Black Madonna at a suggestion from Dora Kalff, founder of Sandplay therapy, to visit one of the mysterious iconic figures in Einsiedeln, Switzerland. Zappacosta was immediately drawn into the “silence and dark interiority of the Black Madonna, and has made an extensive exploration of the history and symbolism associated with her. In this interview for Depth Insights™, Zappacosta reveals the powerful and evocative significance of Black Madonna figure from a Jungian and depth psychological perspective, and shares how she can impact us both individually and collectively. Zappacosta is co-leading a 14-day pilgrimage to Black Madonna sites in Northern Spain in May, 2018. Judy, you have such a really diverse background and of course, I’m always fascinated by the many aspects that Sandplay brings into any kind of a mix. It’s really a unique practice, and while the focus of our conversation today will be primarily on the Black Madonna, I’m wondering if there’s any correlation between the two that we should know about as we jump into the conversation here. Can you share a little bit about what a Black Madonna is first of all, and then how you became interested in it? Well, I think it’s actually not too far a leap if you think of Sandplay as offering the ability to touch the Earth as sand as a symbolic kind of holder or matter and earth. And that the Black Madonna actually is very much related to the Earth’s landscapes—found many, many eons ago which relationship even back to the early goddesses. So, we’re talking today about a deep connection to what is nature, what is matter, what is earth, and what constitutes the divine feminine. I first got interested in the Black Madonna after Dora Kalff suggested when I was doing my Sandplay process with her to take a trip to Einsiedeln, which is where one of the more prominent Switzerland Black Madonna cathedrals is found. And after making that pilgrimage to visit that particular Madonna, I was very, very moved by the essence of sitting before a feminine dark figure that had such a deep interiority, maybe, to her that she just pulls you in, into darkness, into silence, and actually into mystery. Yes. And, of course, this is the thing that’s so intriguing about her—has always been to me as well. And what we do know—I guess maybe we should establish that for those who aren’t as familiar with the concept—what we do know is that the Black Madonnas seem to be sort of found around the world. There are hundreds of them if not more, mostly in cathedrals or gracing shrines—often sacred sites, obviously. And they are something of a mystery though, aren’t they? Because they apparently originated in early Christianity, but I’m sure if it’s in your studies and engagement with the Black Madonna, you have come across different explanations for why they exist. Well, it’s actually really interesting because there’s often a suggestion, “Well, she’s black because she’s Black.” Or “Well, so many people have lit candles at the foot of her altars that she just naturally turned black from the soot of all the wax that has burned before her.” But ultimately, there’s been no way to know for sure what the direct connections are. But certainly, Marie-Louise von Franz suggested that the Black Madonna actually came back through historically from Isis, and the feted throne of Horus, and that this is the beginning kind of that was coming actually out of the goddess sites that were also found in southern Europe, southern France. Many of the sites– the ones that belong now to the church—often sit right upon older goddess sites. So, it’s interesting that there’s a quality of relationship that reaches far, far back, and that we continue to kind of have to suggest what would make her black, why did she show up as black. But for most people, she represents something that has perhaps been hidden away, perhaps rejected. She shows up as a figure, and particularly for peoples that have been marginalized, and interestingly enough, although the churches are where she’s found, it’s actually the people that take ownership in the region where she lives or she is venerated. There’s an ownership that is taken up by the local people, that they are the keepers of—they’ll say—”of the Lady.” So, the Lady is part of their lives in a very everyday way where they go and they change her clothing; they have festivals, dances, lots of relationship to fertility, and motherhood, and things that bring them close to the people that are beyond the church’s style of owning a particular icon, or a particular way of venerating her. 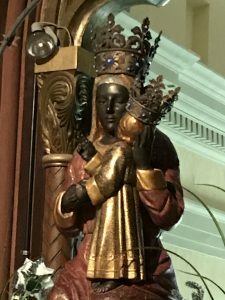 The Black Madonna seems to have slipped through ownership by the church, although she lives within chapels all through the places that you usually find her. But where she’s been found is often way upon rural wild wilderness places, less-traveled regions—lots of different ways that she has always been discovered…..